It may seem incongruous that a renowned research library for the study of American decorative arts has an outstanding collection of paper dolls. This extensive and greatly used collection was donated in the 1970s and 1980s by Maxine Waldron, art teacher, amateur artist, and enthusiastic doll collector. 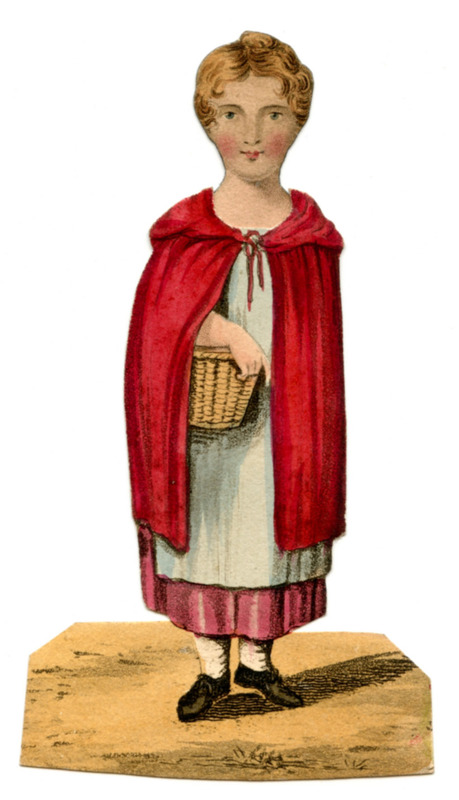 Miraculously surviving despite the medium’s fragility, these paper dolls offer much information to today’s researchers on fashion history and changing attitudes toward childhood. The collection spans several centuries and includes an assortment of dolls, such as handmade and printed dolls as well as ones from advertising, newspapers and magazines, and ones of well-known figures. The collection also includes dolls accompanied by boxes, books, cloth costumes, and greeting cards. Several sets from the late 1700s and early 1800s were fashion plates and not intended for children’s play. In 1810, printsellers and stationers Samuel Williams and Joseph Carr Fuller, located at the imaginatively named Temple of Fancy in Rathbone Place, London, published what is believed to be the first commercially printed paper doll intended for children’s use. Known as a toy book, The History of Little Fanny consists of a paper doll, several costume changes, and a small booklet housed in a slipcase. Fanny is not a full-length doll, only a head and bust. When the doll is slipped behind a costume, it measures only 4½ inches tall. Keeping with the early 19th-century notion of children’s toys imparting a much-needed morality tale, the story of Fanny is a lesson in obedience, with instructions on dressing her to symbolize her status in society. At the beginning of this redemption story, told in couplets, Fanny, dressed in a white frock holding a doll, is a vain, idle child who is more concerned with her fine clothing and amusements than cultivating her mind with books. Rebelling against her mother’s edict forbidding her to unnecessarily wear her new fur-trimmed coat, muff, and bonnet, Fanny skips out of her house with her “wicked maid” only to befall tragedy when a beggar girl robs her of her finery, leaving Fanny in the thief’s tattered clothes. An unidentified woman hires Fanny as an errand girl and she then proceeds to work her way up the chain, first delivering fish, then milk and eggs. 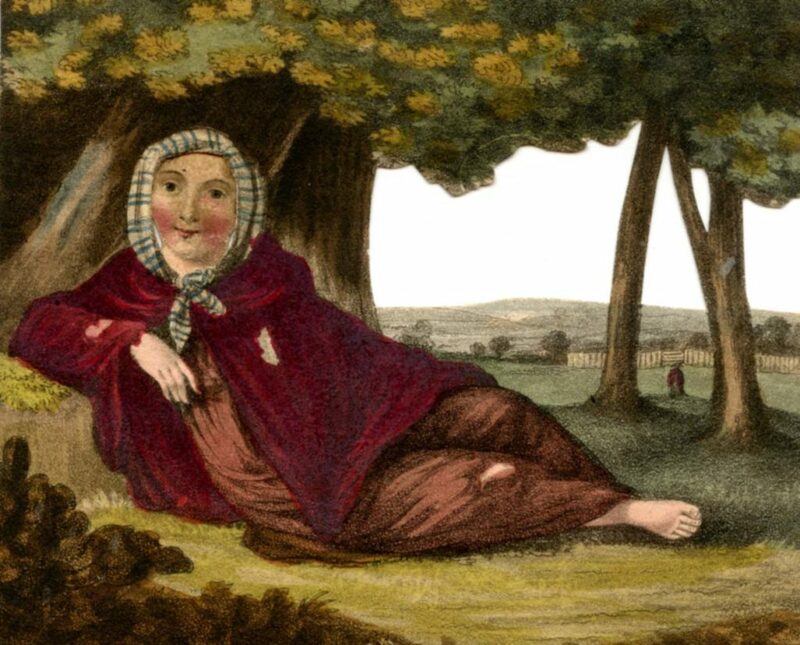 Fanny sports several, fairly decent outfits during her travails: a cloak with hat in hand to denote the beggar’s clothing and three dresses and accoutrements appropriate for delivering goods. Her luck changes one day when Fanny is tasked with bringing butter to her mother. Upon recognizing her house and afraid her mother will reject her, Fanny sits on the steps to cry. Her mother, seeing her grief-stricken daughter, folds her into a hug and all is forgiven. The last chapter concludes with a repentant Fanny attired in a modest frock holding a book in hand to reflect her new studious demeanor. This 13-page toy book is targeted to a young audience, so adult readers shouldn’t focus on the gaps in the story (mainly the absence of a timeline that informs the length of Fanny’s suffering). Somewhat puzzling is Fanny’s ignorance of her address. However, most shocking are the lines “Had she but known her mother’s watchful eye/Follow’d her close, and was for ever nigh,” revealing her mother orchestrated or was at least aware of the punishment. This seems to go beyond a lesson in obedience. Nevertheless, Little Fanny proved to be immensely popular, was reprinted numerous times, and even spawned other iterations. Advertised as the companion to Fanny, The History and Adventures of Little Henry also debuted in 1810 with Ellen, or the Naughty Girl Reclaimed close on its heels the following year. Ellen’s story resembles Fanny’s. It is of a disobedient girl who runs off to play in her nice clothing. The story takes a departure when Ellen falls into a muddy ditch ruining her clothes, thereby angering her father, who sends her to the school in the village kept by Ellen’s nurse. Ellen reacts very badly by throwing a book in the nurse’s face. Resisting her punishment, she runs away to the woods where a gypsy steals her cloak, which forces her into gathering sticks for work. Ellen falls ill, frightening the “cruel” gypsies, and a woman rescues her, nursing her back to health and giving her fruit to sell. Luckily, her mother catches sight of her, and Ellen’s return to grace is completed. This is a more convoluted story than Fanny’s, but at least her mother wasn’t a participant in the punishment. Instead of following the same disobedient formula, Henry’s adventures show how cruel fate can alter the course of someone’s life. Born to wealthy parents, baby Henry is left unattended outdoors one day by a careless nursemaid and swooped up by a gypsy. Despite his parents searching for him, Henry is not found and is raised by gypsies until sold to a chimney sweeper. 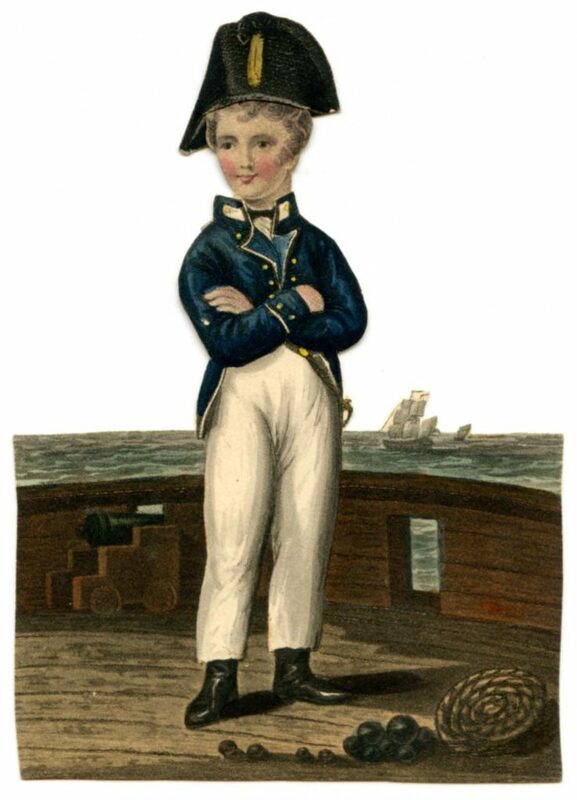 Henry, running away from this life of drudgery, becomes a drummer in a soldier band and then a sailor working his way up to midshipman, respected by all. Somehow his parents finally discover his whereabouts, and a happy reunion takes place. What strikes me as fascinating in the latter two stories of Ellen and Henry is the appearance of gypsies as an evil force. England’s history of dealing with Gypsies, Romas, and Travellers has always been a contentious one, beginning as early as 1530 under King Henry VIII with laws forbidding them to enter the country or face deportation. Despite the repeal of some anti-Gypsy laws in 1780, the fear still existed with new vagrancy legislation enacted in the 1820s, some of which is still on the books today. These early children’s toy books reflect the anti-Gypsy sentiment of the times, giving readers today another lesson in history not intended by the original creators. This is the first post in a series about paper dolls housed in the Winterthur Library’s Maxine Waldron Collection of Children’s Books and Paper Toys. This entry was posted in Ephemera, Library, museum collection, Uncategorized and tagged doll collections, little fanny, paper dolls, Winterthur Library, Winterthur Museum Garden & Library. Bookmark the permalink.